MISSION, KS--(Marketwired - Oct 10, 2013) - (Family Features) Autumn is here -- and along with those cool, crisp mornings comes a craving for something warm and delicious. Enter the Mini Pumpkin Pie Spiced Donut, a sweet morning treat baked with the quintessential flavor of fall. 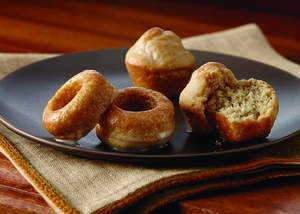 "You won't believe how easy it is to make these donuts at home," said Mary Beth Harrington of the McCormick Kitchens. "They're perfect to mix together with your kids -- no trip to the bakery required." For the final touch, dip the donuts in a fall-inspired glaze. Flavors like vanilla, mocha or maple complement the pumpkin spice in the donut -- the ultimate autumn indulgence.